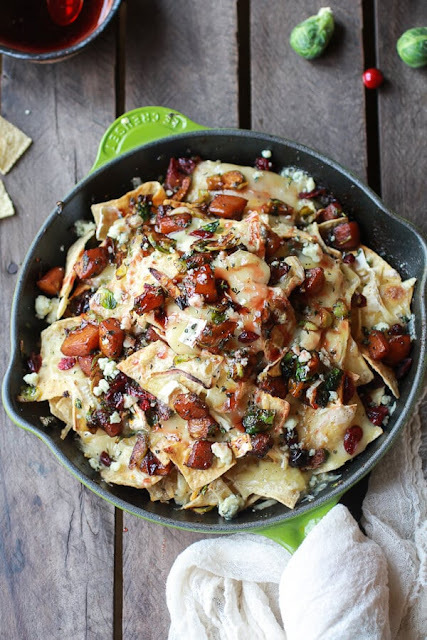 These nachos are the perfect appetizer to serve as a Thanksgiving (or Christmas!! Just look at those gorgeous red and green colors!). Heat a large skillet (10-12 inches) over medium heat, add the olive oil. Now add the butternut squash, sprinkle with brown sugar and season with salt and pepper. Cook over medium heat stirring frequently to avoid burning for 15 minutes or until the squash is fork tender. Now toss in the sliced brussels sprouts, garlic, thyme, chili powder, cayenne and crushed red pepper. Continue to cook another 10 minutes, stirring frequently until both the squash and brussels sprouts are beginning to caramelize all over. Once caramelized, remove from the heat and stir in the dried cranberries. Slide the mixture onto a plate. In the same skillet you cooked the veggies in, add 1/3 of the chips to the bottom and then cover them with 1/3 the cheese (a little brie, a little fontina), then sprinkle with 1/3 of the veggie mixture. Repeat this 2 more times until all of the cheese and veggie mixture have been used. Place the skillet in the oven and bake for 7-10 minutes or until the cheese is melted and bubbly! Remove from the oven and sprinkle with the gorgonzola cheese (or you can add this before with the rest of the cheese) and serve drizzled with the Cranberry Molasses (do this!). Devour! To make the cranberry molasses add the cranberry juice and brown sugar to a small sauce pot. Bring the mixture to a boil and cook 5-8 minutes or until the mixture is reduced and syrupy. Serve with the nachos. If the molasses gets too thick just add a little cranberry juice to thin it out. 0 Response to "cranberry, butternut and brussels sprout brie skillet nachos"